Canada needs sustainable future without brutish resource exploitation. Canada, in the Harper years, has become a world leader in something with far more serious consequences than patronage and phony government expense claim scandals — rapacious resource exploitation. How ironic that a country once seen as a solver of world problems is now increasingly seen as a cause of them! Our Prime Minister and Cabinet ministers often travel to the United States and Europe (as Stephen Harper and his resource minister Joe Oliver respectively did last month) to hector the world in support of frying the planet. On behalf of all Canadians, our officials flaunt how oil money has stuffed Canada's public purse, and give morality lectures to non-resource exporters whose economies have been victimized by corporate trade globalization. They spend millions of tax dollars lobbying shamelessly for the tar sands in general and the proposed Keystone XL pipeline in particular. 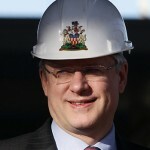 To our shame, Canada is fast becoming the poster child for the depraved indifference of the energy barons. The point of the tar sands scheme — over which its proponents are inveigling politicians with promises of pipeline jobs – is to ship raw Alberta bitumen to Texas for the benefit of the notorious US right-wing billionaire Koch brothers. Alberta's tar sands oil is dirty. "For every barrel of tar-sands oil that's extracted, significantly more carbon dioxide enters the air than for every barrel of ordinary crude — between twelve and twenty-three per cent more," writes Elizabeth Kolbert, in the New Yorker. She was not impressed by Stephen Harper’s bullying style in his New York visit, finding him a bit sinister. She wrote, "With a touch of menace, he added, 'I know the Administration will do a thorough analysis before arriving at the right decision.'" Because extracting tar sands oil causes environmental devastation, not to mention downstream pollution, many in the European Union want to discourage further exploitation. To their astonishment, Harper sent Natural Resources Minister Joe Oliver to Europe hoping to change their minds. "There have been massive lobbying campaigns by the car industry, by the chemicals industry, banks, food giants, etc.," Satu Hassi, a Finnish Member of European Parliament, said in 2012 about the Canadian lobbying efforts against the FQD. "But so far I have not seen such a lobbying campaign by any state." Future generations face a terrifying legacy due to heartless multinational corporations, the super-wealthy people who run them, and the politicians who serve these masters. And, to our shame, Canada is fast becoming the poster child for the depraved indifference of the energy barons. Even Joe Oliver occasionally acknowledges that the majority of scientists and the public are convinced that climate change is triggered by increased amount of fossil fuel being burned worldwide. Every week, the news cycle includes weather catastrophes triggered by human activity and negligence. Monster tornadoes (Oklahoma last week), floods (central Europe this week) and hurricanes (Sandy, last fall), water shortages, crop failures and food shortages and chemical and radioactive pollution stories have become routine, thanks to the most powerful people that have ever lived. Canada's reliance on resource and environmental exploitation doesn't end at home. Canada has a proud history in the world. In the past, we were known for freeing Holland from the Nazis, for inventing international peacekeeping and for launching Greenpeace. Now we are becoming known for our mining companies, which operate with taxpayer subsidies and virtually no laws governing their conduct abroad. The US has laws like that, but, according to CBC News, "There are no mechanisms to hold Canadian companies overseas accountable for their social and environmental policies." Around the world, Canadian mine operators are embroiled in controversy. Last week, SGN covered a delegation from northern Greece touring Canada to draw attention to a huge expansion in their area by Eldorado Gold of Vancouver. The mine threatens local water supplies and ancient historical artifacts in the third-biggest Greek tourist area. Thousands there are protesting and being met, the delegation reported, with severe repression and brutality. Also in the news this week are huge protests and widespread repression in Kyrgyzstan, where 55 people were wounded and 80 detained in clashes at a mine owned by Centerra Gold, also of Vancouver. Protestors there are calling for nationalization of the mine. CBC tells us that citizen's groups in at least 10 countries are complaining about Canadian gold and silver miners' environmental practices. Canada has become a leader in global mining, CBC reports, because of the favourable environment here for high-risk, speculative investments, the kind that drive international mineral exploration. As mentioned in several recent columns, our world changed dramatically in the 1980s, with the arrival of Reagan, Thatcher, Mulroney and global corporate trade deals. These politicians and deals shipped good jobs out of industrialized democracies and sent them off to the low-wage jurisdictions with poor environmental protection. The job market around the world dried up — except in resource exploitation, the ugly face of Canada under Stephen Harper. The fact is that Harper cannot be forced to go to the polls until 2016. Given the man's track record on truth, it's surprising anyone would take him at his word that there will be an election in 2015. If things look as bad for him then as they do now, in the wake of Senate-gate, he'll hold off as long as possible. Still, at the moment, it's likely the Harper regime will end after this term, barring a palace coup. Canadians need to begin talking about and planning now how to achieve an economy based on energy and environmental sustainability rather than exploitation. Canadians in municipal and provincial government and community groups need to plan and build a national consensus around how Canadians see a safe and healthy future for ourselves and the world. Waiting until Harper is gone will waste precious time. Canada, under Harper, has done enough wasting.